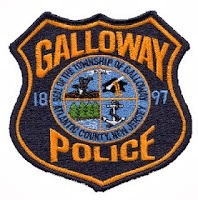 Galloway Township Police responded to 862 calls for service during June 22, 2014 through June 28, 2014. Additional statistics include: 6 Burglaries, 14 Motor Vehicle Accidents, 60 Tickets issued, 2 Driving While Intoxicated, 26 Arrests, 15 Domestic Violence, 16 Fire Calls, 95 EMS Calls and 0 Juvenile calls. Jason D. Santo, 32, of Atco was arrested by Ofc. John Mooney for DWI on June 22. Michelle L. Camelus, 20, of Galloway, was arrested by K-9 Ofc. Scott Winneberger for possession of less than 50 grams of marijuana on June 24. Heather Wolfe, 35, of Northfield, was arrested by Ofc. Fenil Ghandi for driving while suspended for more than two DWIs on June 26. Aubrey B. Taylor, 24, of Washington, DC was arrested by Ofc. Steven Vernon for possession of less than 50 grams of marijuana on June 28. Mario Sandoval- Ramirez, 34, of EHT was arrested by Sgt. Joseph Picardi for DWI on June 28.